I currently own a 2003 Jeep Wrangler Sahara. I purchased it used five and a half years ago when I had a high paying job and no bills. A year ago someone ran a redlight and smashed into my boyfriend's car while I was driving it. It was totalled and health issues following that forced me to stop working. He now uses my Wrangler as his daily driver to get to work and pays all the bills, including the gas for my thirsty baby. Since it's worth as much or more now than I originally paid for it I'm hoping to trade it in for a more fuel efficient and comfortable car. I haven't been able to find one that fits all our needs well enough to make me give up my Jeep though, so I'm hoping you all can help. I'd look at buying another Wrangler. They hold their value like none other and should provide low cost to repair due to their simplicity. If you wanted some thing that is more fuel efficient and luxurious I'd recommend a Buick Encore. Of the sub compact cuv's it offers longer four year warranty than the others if you look at the newer ones. The oldest 2013 Encore on cars.com is right in your price range. 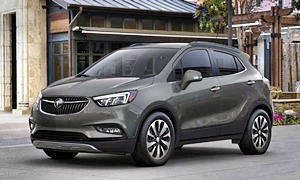 It looks like the 2013 Buick Encore has the reliability, comfort and fuel efficiency I was looking for. Unfortunately it doesn't fit the 'sporty design' my boyfriend requested and is well out of my price range. If I were to stick with a Wrangler, I would keep the one I already have because I've done many, many repairs to it to get it into the condition it is now. I would hate to buy another used one that might have unknown issues. Thanks for the suggestions, though! I wouldn't go with a Wrangler for comfort, fuel efficiency, or reliability. The Wrangler is the antithesis of those traits. The Encore screams old people to me. Since you only need two seats, I'd go for a 2010+ Mazda MX-5 Miata. Reliable, stylish, and efficient. It might not be the most comfortable riding car, but the seats hug you and you won't notice the firm ride after experiencing the fun of driving it. I owned one a while ago and is one of my top 3 favorite cars I've owned. 0 problems in the 5 years I owned it, except when someone rear-ended me and a couple things broke because of the collision. It may make you fall in love with cars if you drive one (with a stick-shift of course). It won't hold too many things in the trunk, so maybe my next option would be better. The 2010+ Mazda3 Hatchback (or sedan) is a good car. It is efficient, very reliable, practical and has a comfortable ride. There is a lot of road noise, so look for that in a test drive. It is one of the most sporty options and is fun to drive. The 2007-2011 Honda Civic Coupe or 2008+ Accord Coupe are practical and very reliable. It has a sporty design, is comfortable, efficient, and pretty fun. Again, these cars have a decent amount of road noise. The 2007+ Prius is another option, though the previous generations were not sporty at all in driving dynamics or style. It is comfortable, gets 50 MPG, super reliable (mine is still running with 250k miles), and is way more practical than it looks on the outside. Quiet interior, too, and is the most comfortable car on my list. These cars are built with efficiency and reliability in mind, not sportiness. Oh, lord, LectroFuel. It's like you've dug into my head. I've never owned an automatic car and I'm already in love with driving... I just haven't been able to exercise that love for a long while. The Miata has me sorely, sorely tempted. I'll have to see what the boyfriend says about that one. Probably that it's a "girly" sports car, but I love it. 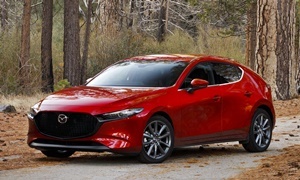 I was already looking at the Mazda3's. I like a good hatch myself (my first car was one), but I don't think the Mister would go for it. The sedan ticks all the boxes as well, but I just wasn't sure about the looks. 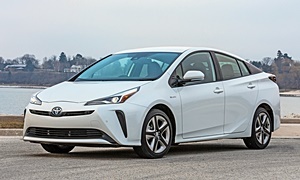 The Prius is probably the most logical choice for all the things I want, but that would put my boyfriend on the bench. I think he'd rather die than be caught driving a Prius thanks to the heckling they've been given repeatedly by our favorite car show hosts. 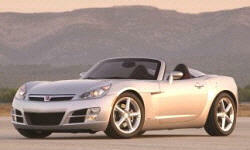 If your think small convertible I'd look at a Pontisc Solstice/Sturm Sky. I picked up a more edge style 2007 Sky back in 2009 and 50,000 miles have not had to any repairs or maintence besides tires, oil, and batteries. Mine is the turbocharged version with a ecu tune is as fast as a Corvette with 400 lb-ft of torque. The turbo-4 gets 42-43 mpg at 60 mph with the top up and slightly less with the top down. It makes a great autocross car for zipping between the cones. Prices are very good now for the buyer at season end for $5,000 or more. But space is at a premium in these cars. LexTalionis, NormT is a GM fanboy and will always support GM in their products regardless if they are good or bad. He is really biased in the cars he mentions. The Solstice and Saturn Sky are not as good as the Miata; just ask any automotive enthusiast other than NormT and they will say the Miata definitely wins. The Pontiac isn't nearly as reliable or efficient, doesn't drive as well, isn't as fun, and is made by two companies that went out of business. One reason alone why I wouldn't buy the Solstice is because you can't even put the top down or up without getting out of the car. The Miata lets you do this while sitting in the driver's seat in 3 seconds. The gear ratios in the manual Solstice are too wide according to Consumer Reports, Motor Trend, and Car and Driver and are considered to be "a major flaw." The Solstice weighs more than 400 lbs more than the Miata and its interior is old GM quality. The only selling point to a Solstice is that the optional gas guzzling engine is quicker than the Miata. 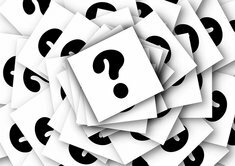 The Pontiac and Saturn were also subject to the GM ignition recall that was the cause of accidents that killed 124 people and injured hundreds. The Solstice does not get 42 MPG. Fuelly says owners get around 24 MPG combined. Don't think of the Miata as a "chick car." It is one of the most popular track cars for good reason. It is also a great everyday or commuter car if you don't need a big trunk. Don't modify the suspension if you want a comfortable ride. Here are some Miata vs. Solstice comparisons. They all say the Miata wins. 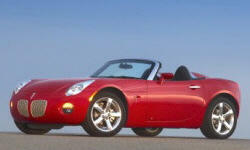 http://www.motortrend.com/cars/pontiac/solstice/2006/compact-convertibles-comparison-mazda-mx5-vs-pontiac-solstice/ ? 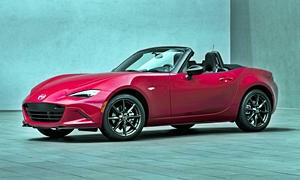 "Mazda is still the established master of the compact, affordable roadster game." The Miata has been known as a male hair dresser's car. The Kappa platform has a similar design as the big brother the Corvette and has a 175 hp 2.4l or a 260 hp 2.0T. Neither of the engines was subject to gas guzzler tax, so I don't know why am you are spreadin false information. The components are used in other cars so the supplies are many and very inexpensive to replace and maintain. The turbocharged versions can easily achieve 40 mpg as even my old Cadillac ATS4 2.0T could see 37 mpg...with AWD. At highway speeds they are very efficient. The 2.0T received a GMPP upgrade for a power increase of 290 horsepower and 340-360 lb-ft of torque with a factory warranty. The drive train is very well engineered and built to last. Mazdaspeed turbo was dropped in the Miata many years ago and never replaced. No problem being a GM fanboy, as you say, as they are making some of the awarded cars in their segment. They are the fullest of full line manufacturers and have increased profits from sales for most of the last decade. If you shop they are also some of the best priced cars, suvs, and trucks. The better styling of GM new vehicles are standing in where Toyota extroverted styling becomes polarized. So, I spent two days visiting dealerships and test driving cars in my range. As it turns out, the Mazda3 was the one for me and my boyfriend highly approves. Thank you both so much for the advice!